Please refer to our stock # 1757 when inquiring. Reply to Ms KD: as noted here, these have perfectly working turn wheel SBs, Please see image 2. Earrings are the first to go! 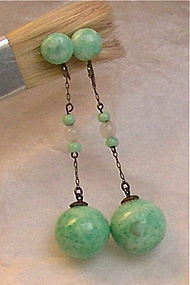 These Art Deco 12mm simulated green jade stone Peking art glass bead earrings on sterling silver, no less, are a must have! The globule infused beads, made to resemble green jade, are referred by some as Chinese peking glass a sought after collectible. The Sbs back findings are working turn wheels that are stamped: Sterling. Please see image 2. North to South 2" on the teeniest chain ever seen! The silver is dark and needs a good polishing! Beautiful preowned vintage condition and ready to show off. $12 USPS Priority/Ins/Track or FREE with USPS MO or your USA check. Shipping outside the USA is suspended. Please find a USA buying service to pay for and receive your package.